Today we were speeding off from Kagoshima on a high speed hydrofoil all the way down to the lush island of Yakushima. Yakushima (屋久島= roof + long time + island) belongs to the Ōsumi Island chain and is located about 130km directly south of Kagoshima. A large portion of the island was declared a UNESCO Man and the Biosphere Reserve in 1980 and 13 years later it was listed as a World Heritage Site due to Yakushima’s ancient and unique warm/temperate forests. Yakushima is nearly circular in shape and has a circumference of 89km with most of the surface covered in lush moss covered cedar forests. The island is very mountainous for its size with the tallest peak, Miyanouradake, climbing to a height of 1, 935m above sea level, which is nearly twice as tall as Sakurajima. The shape and height of the island suggests volcanism but the bedrock is made up of plutonic (non volcanic) granite and there are no active volcanoes on Yakushima. Instead of ash and lava, water rains down on subtropical Yakushima more than everyday and the Island is the wettest place in Japan receiving an average of 4,477mm a year. It is, in fact, one of the wettest places on earth and in some years has received over 10,000mm, which is enough to rival even the rainiest of locations. Even the locals have noted that it rains 35 days a month. Despite a relatively low latitude of 30 degrees north, the high elevation of Yakushima’s mountain peaks causes the falling water to freeze in the winter months and the resulting snow can cover the ground for months. Meanwhile, down at the coast the ocean water does not drop below 19°C. The most famous organisms on the island are the Yakusugi (屋久杉 = Yaku + Cedar Tree) which are Cedar trees that are more than one thousand years old. Japanese Cedar trees usually live for around half that time, but on Yakushima the poor nutrient granite soil causes the trees to grow slowly and the high rainfall results an excess of rot resistant resin. The known yakusugi on the island are named and the most popular activity on the island is hiking through the mountain forests to visit these ancient trees. The most popular trail on Yakushima leads to the Jōmon-sugi which is a yakusugi thought to be between five to seven thousand years old, which may make it the oldest tree on earth. Jōmon-sugi's actual age is hard to determine as most of the interior of has rotted away, which is a common consequence of great age in cedar trees. Its name refers to the Jōmon hunter-gather period of Japanese prehistory extending from around 12,000 – 300 BCE. The native fauna on Yakushima include the many red-bottomed macaque (monkeys) and shika deer which are found throughout the island. In the surrounding ocean dolphins and migratory loggerhead turtles can be found. Yakushima has a permanent population of only around 13,000 people but is a popular destination for Japanese tourists with over 300,000 visiting during the year, particularly in the holiday months of August and September. We were visiting at the end of May which is considered to be one of the best times due to the pleasant temperatures and lack of crowds, though unfortunately May also happens to be one of the rainiest months. 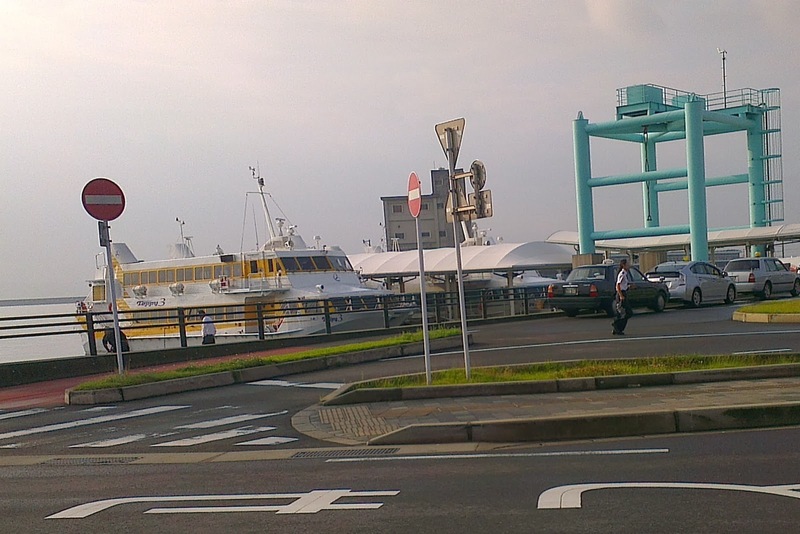 Our hydrofoil boat left the Kagoshima High Speed Terminal at 07:45am which meant we needed to get up at 06:00am so we would have time to store our large luggage at Kagoshima-Chuō Station and make our way down to the terminal. We didn’t want to worry about dragging around our big bags the whole trip. After checking out of our hotel we had no difficulties finding some big spare lockers at the station as we passed through to the tram station on the other side. Since we were leaving so early we were not able to get breakfast at the hotel and instead hopped off the tram a stop early to get breakfast at a nearby McDonalds. It was pretty much the only store open in an otherwise closed shopping street and out the front we saw a few rebellious teenagers. They didn’t look dangerous but were definitely drugged up and also had some alcohol and weird haircuts. In Japanese you’d probably call them Yankii which is a term for juvenile delinquents. The word came about because non-conforming youth would dye their hair blonde which is a hair colour associated with Americans, so from Yankee. Anyway, while eating our bacon and egg muffins we endured a decent walk down to the dolphin port area where the Tane Yaku Jetfoil was located. We were already very glad we didn’t have our big luggage! The Toppy 3 hydrofoil was berthed at the wharf when we arrived- it was quite a big boat. Originally we had tried to book this trip online but ultimately decided to let our reservation lapse as paying within seven days proved to be a little tricky. So upon arriving we had to make sure to buy a ticket from the port building. Everything inside was in Japanese and there didn’t seem to be any English anywhere, though the reception people may have had English guides behind the counter. It was actually getting a bit late by the time we arrived and we were lucky to find that there was no line to get tickets. An individual one way ticket costs 7,700 yen however there is a deal available that lets you buy a two way ticket for 14,000 as long as you return within seven days. So yeah, even with the deal it’s a very expensive boat trip! Other options include a plane from the inconveniently located Kagoshima airport or the car ferry, which is cheaper but takes a long time. While we paid for our return tickets the lady wanted us to pick a time for both trips. As we were not yet sure what time we wanted to come back I asked if we could keep it open, which was fine. We just had to make sure to swap our exchange order for a proper ticket before boarding. The hydrofoil has assigned seating and when we picked the upper when we were asked where we wanted to sit. After getting out tickets there was still a couple more minutes before boarding time so I went to freshen up in the washroom while Kate sat in the waiting area. While we were separated I heard announcements in Japanese saying that boarding had started! When I rushed over, Kate was surprised to see me in such a hurry as the lack of English announcements meant she had no idea that boarding had started. We were one of the last people to climb on the boat however it wasn’t very busy inside- I’d say it was about 10-20% full. The interior was a little old but nothing too bad. All of the seats had seatbelts and we had to make sure we were buckled up while seated just like an aeroplane. Unlike an aeroplane, the seats were comfortable and there was heaps more room. Before we departed there was a brief safety talk in Japanese explaining about the seatbelts, life jackets and such things. Hydrofoils are boats named after the wing like structure that is deployed into water at high speed to produce enough lift to raise most of the boat up into the air. The wing works in a similar way to aircraft wings and in fact the boat we were on was the Boeing 929 Jetfoil. The foil wasn’t deployed when we first departed and we actually barely noticed exactly when it did go down. While under foil, the journey was very smooth and it felt just like we were travelling in a car. As we were in the open ocean and could not see the water rushing past it didn’t feel like we were travelling that fast at all. Inside the boat, there were a few TV’s playing uninteresting content and since it was a rainy day there wasn’t much to see out of the windows. I could occasionally see some other islands though. 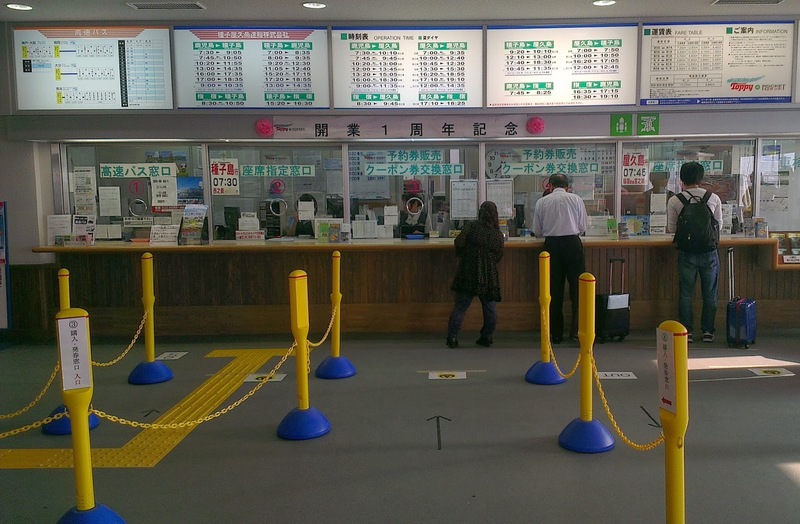 This early service doesn’t run directly to Yakushima and after about forty minutes we made a brief stop at Ibusuki to pick up a few more passengers. After another hour and twenty minutes, at 9:45am, we finally arrived at Yakushima! The first thing I made sure to note was the weather- pretty overcast and wet looking but as it wasn’t actually raining I counted it as a good start. Near the port we could see up into some of the nearby cloud laden mountains. After alighting we had a bit of a look around the terminal area to confirm where we’d get our return ticket and also looked for a hiking map that was highly recommended for Yakushima. It was a little tricky to find but we managed to track it down. 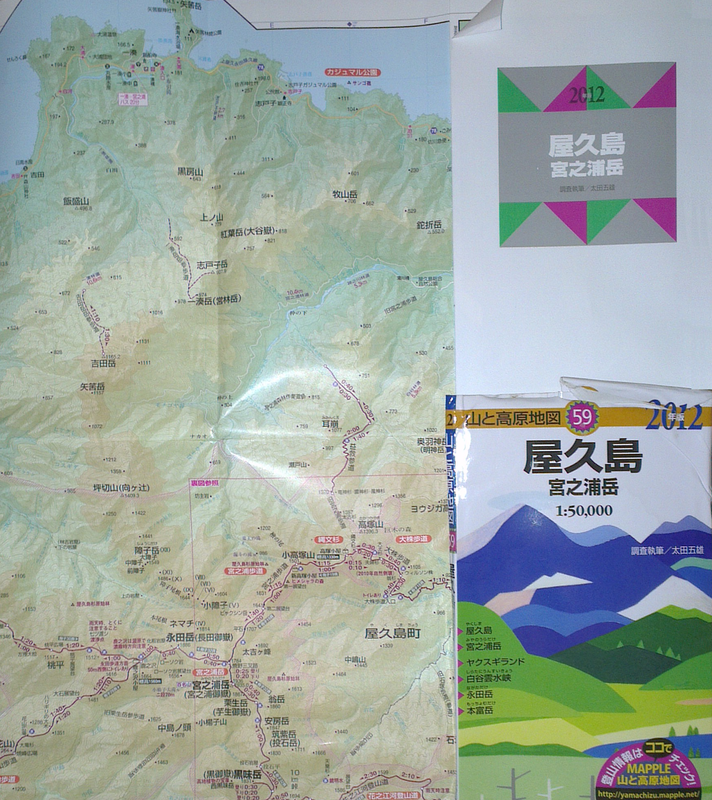 This Yakushima Mountain and Highlands Map is in Japanese, which is fine as the most useful information is the alignment of the walking trails and the fact that each leg has marked the approximate amount of time it would take to walk. One final comment about our arrival, I was disappointed to notice that our pocket Wi-Fi had absolutely no signal even here in Miyanoura which is the biggest town of Yakushima, so we’d be off the grid for the next two days. Next it was time to sort out our transportation! 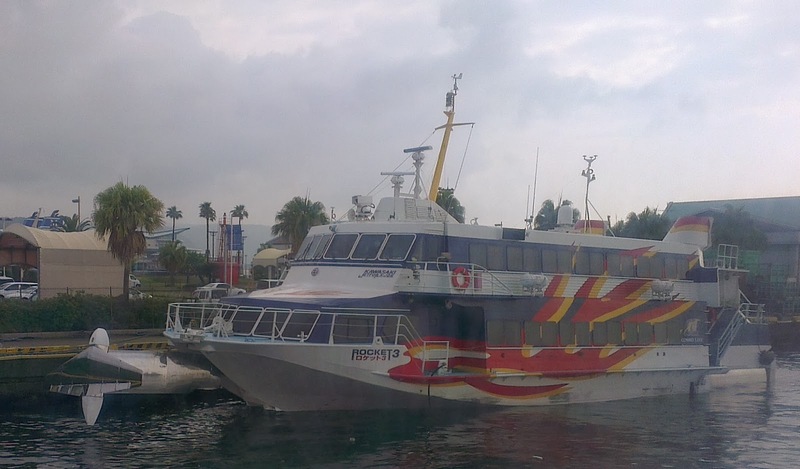 While it is possible to get around the island using buses, it is much easier to hire a car from one of the many outlets near the different ports. We had booked ours in advance from Miyanoura Times Rental Car. Times are a Japanese car parking company which recently teamed up with Mazda to also provide rentals. From the boat we had a 700m walk up to road to the outlet, on the way we passed the Environmental Culture Village Center and stopped in to have a look. There were lots of Japanese books inside but not a lot of displays or anything too interesting. We did pick up a few leaflets on bus timetables though, just in case. Upon arriving at the rental office we saw our first deer of the trip! In the small Times Rental building we had our documents thoroughly checked and scanned before we were brought out to our car. It was a Mazda 2! As per usual we accompanied one of the staff members on a check of the vehicle; there were heaps of bumps and scratches to note! Once that was all dealt with we signed our life away and drove the car down the road to a nearby supermarket/general store. Inside we stocked up on snacks and food for lunch such as bananas, rice balls, sandwiches, kit-kats, chips and nuts. Once back in the car we ate some of the more perishable items and stored the rest for later. Then it was on to our first activity! We had two days on the island and really wanted to do some of the walks through the cedar forests to see the Yakusugi. It was looking a bit rainy at the moment though, and according to the latest weather forecast we had seen (back in Kagoshima) it was going to get clearer this afternoon and tomorrow. So we decided to not embark on a walk just yet and instead spend some time driving around the island. The one hundred kilometre ring road takes about three hours to circumnavigate and along the way you can enjoy the mountain scenery, beaches, waterfalls, deer, monkeys and drive though a portion of the UNESCO world heritage area. Since our hotel was located ninety degrees around the island in the clockwise direction (near Anbō port) we decided to do an anticlockwise loop and set off through the rest of Miyanoura town. Once the few residences had evaporated we found ourselves travelling along the side of high mountains that dove straight down into the nearby ocean. The drive was fun and included lots of curves, hills and tunnels. For a particularly good vista we stopped at the East China Sea lookout to take a closer look at the fantastic scenery! Our next stop took us all the way down the mountain to one of the beaches we could see from above. This was the Nagata Inakahama beach and it’s the nicest I’ve ever seen in Japan with clean and large sand grains. The huge and endangered logger head turtles lay their eggs on Yakushima and this beach is one of their nesting grounds. It was actually nesting season while we were there and there was information about the turtles and warnings that artificial lights are absolutely prohibited at night when the turtles come to lay their eggs. I wondered at the time how you’d be able to see them if lights were banned however now I think you’d have a good chance if you came during full moon. Also, I think that very dim red lights may be allowed. On the beach we could see what looked like turtle trails! It was a little cold for swimming so we just had a walk around on the sand and a poke of the calm water. A couple of other people were braving the water with wetsuits. In the general area there was a toilet block and one or two businesses/buildings in the distance. Back in the car, and a little further down the road we came to a sign for a road that would take us to the Yakushima Lighthouse. This road was very narrow and was only wide enough to accompany one car. We were very lucky to not meet anyone coming in the other direction, especially since the ridge the road was on top of wasn’t wide enough to allow any room for cars to pull off to the side. Upon reaching the end we found a flat concrete area perched on the ridge to serve as a carpark and foundation for the lighthouse. The edge had some concrete walls to stop people falling to their demise and there was a little minibus parked inside. I’m glad we didn’t see this vehicle earlier. Right at the end of the ridge we found a white old style lighthouse! The lighthouse was pretty cool itself but we were additionally able to get some more great views of the ocean down below and mountainous coast line in the distance. I think lighthouses must attract those ligia creatures we had seen yesterday as we saw a bunch scuttling around here too! Beyond the wall surrounding the lighthouse there was a little ledge with a small sort of shrine and beyond that the smooth cliffs plunged down into the ocean below. The rocks we could see up close didn’t look smooth at all as they had large phenocrysts of what looked to be some sort of feldspar. Phenocrysts are large minerals surrounded by many smaller crystals and are formed due to uneven cooling of a molten parent rock. Basically, different minerals precipitate out of a magma at different times and the slower a magma cools the larger the crystals will be. So if a magma cools slowly (at first) to form large crystals of a certain mineral and then is then suddenly cooled quickly (e.g. after an eruption) the rest of the crystals will be small and will surround the isolated big ones. That’s today’s geology lesson done! After we were done appreciating the view we returned to the car and were lucky to once again not meet any cars coming from the other direction. From the lighthouse we continued on into UNESCO world heritage listed national park area. Upon entering this section the road narrowed, the speed dropped and there were some signs advising us about the wildlife. The road also got much more twisty. The drive through the heritage area was very enjoyable and we saw lots and lots of wildlife! All the animals were pretty much either deer or monkeys and some of them even had babies! They didn’t seem too concerned about cars and would slowly amble off the road when they saw us coming. Apart from the fauna, the flora was also very lush and almost completely enclosed the car at some points! We had to be careful on the road at there were a lot of slippery leaves. As far as inanimate material goes we saw lots of rocky streams, little waterfalls and at some points drove over high bridges and through steep wedges of rock. There was only one lane for most of the way so it was a little tricky when vehicles came the other way though there was generally enough room for one car to pull over to the side while the other passed. It was a lot of fun and interesting driving through this section and looking at all there was to see. Eventually we came out of the heritage area and continued a bit further along the ring road to the Oko-no-taki waterfall. After parking at the small car park we got out our apples to eat and walked the short distance down to the waterfall. Huge amounts of water were roaring eighty eight metres down the cliff and the pattern of miniature cascades making up the whole fall was mesmerising. It was the biggest and best waterfall I’ve ever seen! It was possible to climb the slippery rocks and get pretty close to the edge of the gushing stream. The only thing stopping us was a little pool of water at the bottom of the falls. Perhaps we should’ve just jumped in and swum over though as we were already pretty drenched from the waterfall’s spray! It was a lot of fun climbing the rocks! There were a few other people at the falls, probably about ten other people in three or four groups. Before leaving we talked to a pair of girls around our age and took turns taking photos of each other in front of the waterfall. After hopping back in the car we continued around the mountain and soon found ourselves in a less forested more open area. At one point we came to a ‘Fruit Grove’ sign that pointed us down a little road. Eventually we realised that it was just someone’s small little farm and bailed. It was around 2pm by this time and as we still wanted to get a walk in today we decided to bypass the next waterfall and instead continue on to the inland road that would take us to Yakusugi Land. We figured we could see the other waterfalls after our walk as it had no closing time which is in contrast to Yakusugi Land which apparently closes at 4:30pm. Plus it wouldn’t be much fun walking around in the dark anyway. Although it sounds like a theme park, Yakusugi land is actually a nature park, with a number of walking paths built around a concentration of Yakusugi, which are ancient cedar trees over 1000 years old. After a fairly long fifty minute drive we eventually arrived at our destination and parked the car. There were many signs about parking outlining what areas were okay, but there was no charge. There was a fee though for the nearby toilet which was attached to an expensive shop selling things like organic shirts for 8,000 yen ($80). Unlike most hiking trails we had to pay 300 yen to enter and the opening times were explained by the fact that they have someone at the entrance to collect payment. We found that it’s actually still possible to enter after hours if you put your money in a little box instead. With our payment we received a map that had four different major routes marked on it. Each route was a loop that started and ended the same way with shorter ones just cutting across the larger ring to return earlier. We wanted to do the long one which was marked to take 150 minutes meaning we’d be back at around 5:30pm. Right before setting off we returned back to the car to grab some bug repellent as there were a lot hanging around. The path started out as a well maintained boardwalk that snaked through the lush vegetation. Apart from the bugs we also saw some animals, such as cute shika deer at the start! Unlike Nara, and to a lesser extent Miyajima, the deer here are more timid and non-aggressive however you can still get pretty close to them. Along the way we passed over many bubbling creeks and valleys on high bridges, including some small suspension bridges. There were also many other small waterfalls and trickles off to the side of the trail. Along the boardwalk, near the branching point of the shortest 30minute course we came to our first Yakusugi tree! It was the Sennen-sugi (千年杉) which is quite a straight and tall tree whose name literary means “1000 year cedar”. It’s amazing to think that the tree has been growing for so long, since the early middle ages! And it’s not even one of the oldest! As mentioned the path was very well maintained and there were lots of informative signs explaining about things such as second generation growth on old stumps, cedar crafts (from naturally felled trees), buried wood, twin cedars and growth patterns. The main signs were in Japanese though most of the time there was also a little panel off to the side with a translation in English. Vegetation was absolutely everywhere and all the trees and rocks were covered with moss thanks to the high moisture environment. Although there were a fair few stairs the walk wasn’t very onerous, especially at the beginning sections, and we were making excellent time! Apart from length, the different routes are also organised by grade and each time we continued on to the next section the path became a little rougher. By the time we were in longest difficult section the trail was basically just a rocky/rooty path with occasional wood planks for climbing up the extensive hilly sections. So we needed to do a little climbing and scrambling in places. It was quite fun and probably would have been easier if we went slower but we were really trying to push ourselves so we’d have enough time for the other waterfall. As mentioned we were making excellent time! The atmosphere felt a little damp but it was not raining at all and the temperature was perfect- neither too hot nor cold. Towards the turning point for the 150 minute course we came to a turn off for another path that continued for another 2.7km up to the top of Mount Tachu (Tachuudake). We really wanted to climb to the top but had to concede that we didn’t have enough time for another 5.4km, even with our rapid pace. We certainly didn’t want to be walking back in the dark. Also in this area was a little building for disposal of portable toilet packs. Japan really takes toilet availability seriously! Oh, and there was a big cedar tree stump we could climb into which was pretty cool! We also passed a few more Yakusugi such as the Tenchuu-sugi (天柱杉 = Heaven + Pillar + Cedar) which was the tallest in the park at 33.8m tall, 8.2m round and 1500 years old! Next, we came to was a pair called the Hahako-sugi (母子杉), which means mother and child cedar. This pair of trees were the oldest we’d ever seen in our lives so far and were listed to be 2,800 and 2,600 years old, respectively. So it first started growing during the time of early ancient Greece and has been there since! A little way past these trees we came to a turnoff for the Hana-no-ego which is marsh that was posted to be 8.2km away. A sign nearby stated that this path did not belong to Yakusugi land and taking it would be at our own risk. As a bit of a spoiler- we’d be heading there tomorrow! Though starting from a different point. As we made our way back the path improved as we joined up with the easier routes. On the second hardest route we found the Budda-sugi (仏陀杉) which is so named because a section of its bark resembles the face of Buddha. The tree is 1800 years old and a viewing platform was built to project the organism and image, which is especially fragile. The final Yakusugi we passed was the Kuguri-sugi, which was interesting as it kinda had two trunks that were split at the base. There was also a cage over some other plant which confused us until we worked out it was probably being used to protect the plant from animals. Eventually we came back to the car park to find the entrance lady and most of the cars gone. I say eventually but we had actually made fantastic time and managed to complete the 150 minute course in only 100 minutes. We had made sure to properly appreciate everything along the way too. Although it was nearly 5pm and the day was nearly over, it was still light enough for us to drive all the way back down and around to that waterfall we had skipped earlier. This was the Senpiro-no-taki waterfall but unfortunately we were not able to get a great view as the top half was obscured by thick fog. Well we could see the bottom part at least, so the trip wasn’t a total waste. The actual falls are located a long distance from the viewing platform and I’d say that even without the fog Oko-no-taki would definitely be the superior waterfall. Near the viewing platform for Senpiro-no-taki we happened to meet the two girls we had talked to some hours ago back at the other waterfall! We each asked what the other had done in the meantime and apparently the girls had spent some time bathing in the various different hot springs around the island. We said we wanted to try them too and they recommended one onsen down near the beach. The river hosting Sepiro-no-taki actually contains multiple falls and we drove down a bit further to the final one, named Torooki-no-taki, located just before the beach. It was a bit tricky to find somewhere to park at first, though we managed. To our surprise, the girls we had just talked to had the same idea and had come here as well! It was a bit awkward at that point so both pairs just pretended to ignore each other, except for when we passed on the short walk down to the falls. Then it was all “Oh!” “Hello again!” “Hahaha”. Anyway, the waterfall here was also far away but wasn’t covered up by fog so we were able to get a good complete view. It wasn’t particularly high or spectacular but was certainly worth a visit all the same. It was also interesting to see a waterfall right next to the beach. Plus, apart from the main attraction there were also great views of the coast itself from the viewing cape and we also saw some cute bright orange crabs! By the time we returned back to the car it was past 6pm and time to head down to check into our accommodation. Tonight we were staying at the Cottage Morino Kokage, which are cottages that were very highly rated online and offered reasonable rates. We had a bit of trouble finding out where to go using our cars GPS as it couldn’t find the place’s phone number (which is a normal way of looking up addresses in Japan), and we could match up where it ought to be on the map. We did have some written instructions though and following them until we found the sign wasn’t too difficult. As we drove in to the property, the owner came up to us and directed us to go park at the cabin we had been allocated. He was a bit weird actually, but aren’t we all, and he gave a good introduction to and explanation of, our cabin. We had ordered a packed breakfast and lunch for tomorrow (for hiking) and the guy told us we’d be able to collect them from the guest cabin early the next morning. This small guest cabin was also the only location the free Wi-Fi would work in and also had a vending machine and a few other things. Before leaving he told us to keep the doors and windows shut because of the many bugs. The cabin was pretty nice and included four bunk beds, a hammock, fridge, TV and a private bathroom. We did have to make up our own beds a little with the supplied bedding. Lunch had been brief and long ago, so we soon ventured back out again in search of food. 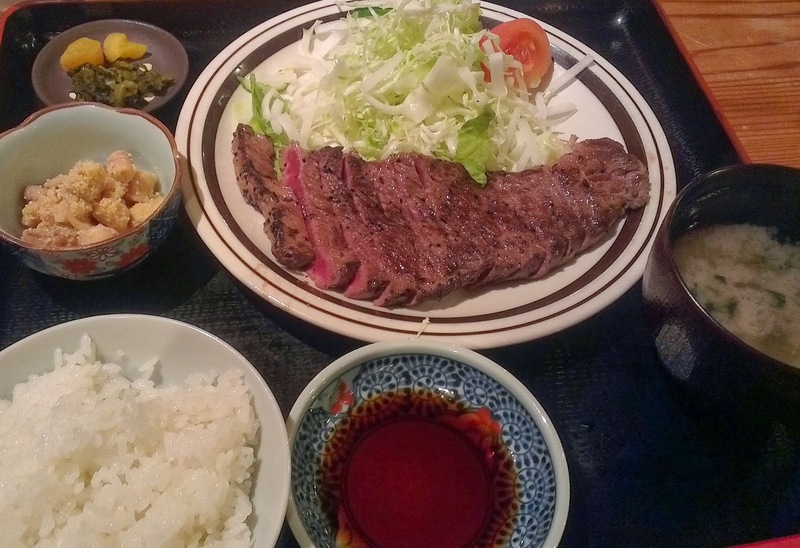 With our hotel information there was a list of restaurants in the nearby town of Anbō, and we had shortlisted a few. The first we looked at was an udon shop and since it looked pretty good, though a little scary, we decide to go in and were directed to a table. The inside was quite nice and there were lots of books about the area and big pieces of cedar furniture. On the menu the many different delicious sounding meals meant we had trouble deciding and we eventually ended up picking two to share between us. 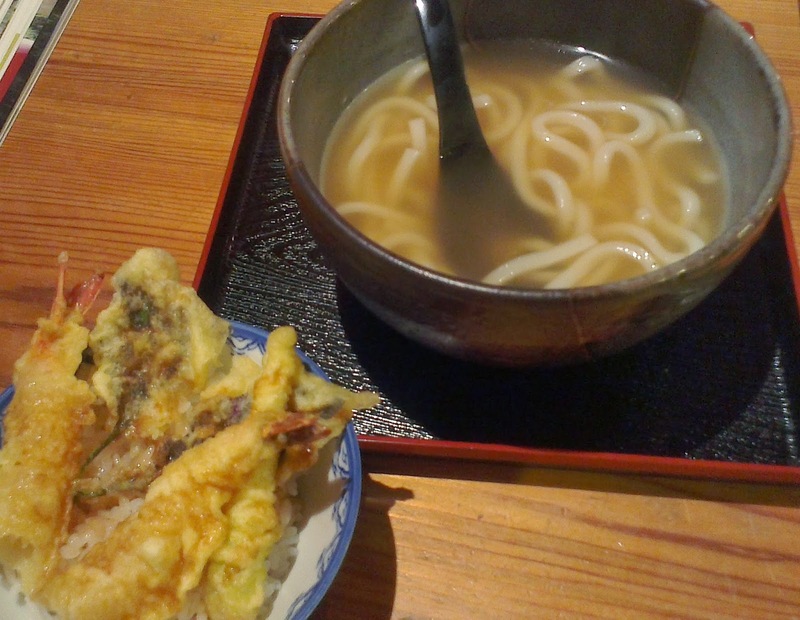 One was a delicious steak and rice meal and the other was tempura udon. Towards the end of our meal the guy that served us came over and warned us not to open the window as there were many bugs. The entire window was covered in millions of them and some were somehow managing to squeeze their way underneath and into the restaurant. Though they emerged slightly squashed. After dinner we returned back to our cabin and spent some time with the various maps and information we had trying to work out our plants for tomorrow. The walk to oldest Jōmon-sugi is the most popular activity on Yakushima but we thought there probably would not be enough time for us to do it as it takes ten hours and we really didn’t want to risk missing the last boat back to Kagoshima. We considered just doing the walk as far as Wilson’s stump before we realised that it was already too late to buy the a bus pass that you need to reach the main trail head (as no cars are allowed). In the end it’s probably better to save the whole walk for another trip anyway. So we abandoned those trails (Anbō and Okabu) and instead studied the excellent map we had to try and find something else. It was a bit difficult since we had to go on a trip outside to use the Wi-Fi, but we eventually decided upon the Yodogawa track. The trail head was located at the end of the road we had used to Yakusugi land and sounded like it had some interesting sights such as marshes and a detour to a mountain. The island is really quite covered in many interconnecting trails and the one we had selected was part of a long multiday hike you can do up to the highest peak on Yakushima. It even connects to the trails that lead to the Jōmon-sugi. Before bed time I tried to use the WiFi to check out the weather. It looked promising with a cloudy but mostly rain free day predicted! Look forward to the next post that will cover our hikes on our last day in Yakushima! Or, are you considering visiting or have you recently travelled to Yakushima? I'm visiting Yakushima in a couple of weeks, stumbled upon your blog; I must say that I thoroughly enjoyed reading your posts! You mentioned: From the lighthouse we continued on into UNESCO world heritage listed national park area. By any chance do your remember the exact location of the turning? P.s I'll be renting a car to go around the island too! That's great! I'm really glad you're enjoyed it and I'm sure you'll have a great trip! Renting a car is definitely the way to go on Yakushima, we had avoided it before the trip but it definitely makes a lot sense for some locations (obviously not Tokyo though!). The junction between the main ring road (which continues south west to the UNESCO area and North east to the Nagata Inakahama beach) and the lighthouse on Nagata Cape is located at approximate latitude 30.3889° N, longitude 130.3875° S.
Thanks Eric, I found the road! I plan to go to Yakushima as well (next year, but I'm planning early), and I saw this post! How many days in total that you spent in Kagoshima & Yakushima, I plan to stay there for about 4 days, is it enough because from your post seems that it takes about 2 days plus to cover Yakushima :). How many nights are you there for? We had two nights in Kagoshima and one night in Yakushima. So 3 total nights and 4 days, however half of the first day we spend traveling from Nagasaki. I think if it was two nights in Yakushima and one night in Kagoshima it would have been enough as the slight issue was not having a day with no boat trip while on Yakushima. I think one day is plenty to see Kagoshima city and Sakurajima. Next year is not too far away, I'm sure you'll had a great time! Thanks a lot for the quick reply!! That's great to know. My plan is to have 1 week to 10 days of Japan trip. However, I'll be flying to Tokyo and spend 3-4 days in Tokyo and the rest is for Kagoshima trip (flying there, not shinkansen to save time). Sorry for the really slow reply this time, I suddently got really bogged down at university. 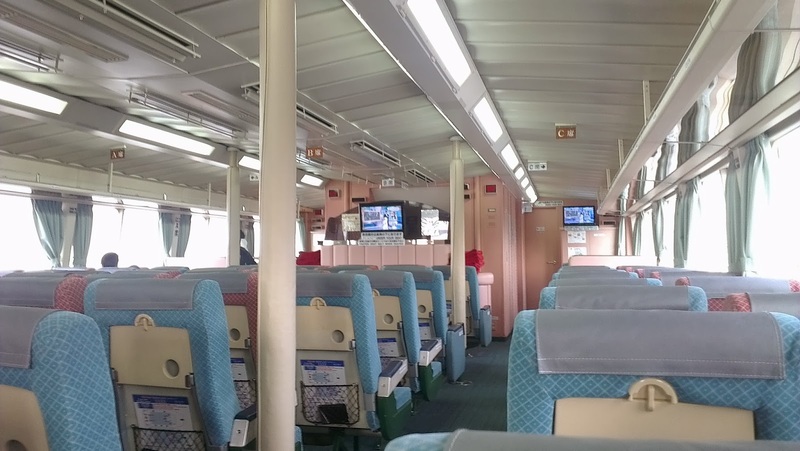 There's four tables, left is Kagoshima to Yakushima, right is Yakushima to Kagoshima. Top is the 15/09/2015 - 30/11/2015 timetable, bottom is the 01/12/2015 - 11/03/2016 timetable. Timetable for beyond the 11/03/2016 isn't available yet from the look of things. There's also the last column in each table "notes"